Blue Origin has yet to launch a rocket from Florida, but it is already planning an expansion of its operations in the Sunshine State, the Orlando Sentinel reports. According to Space Florida, the state’s spaceport authority, the company is moving ahead with a $60 million facility in Exploration Park, the state-run complex near Kennedy Space Center where Blue Origin has already built a more than $200 million rocket factory, set to open early next year. The new testing and refurbishment complex will create about 50 jobs with estimated annual wages of $70,000, plus benefits, according to Space Florida’s board of director meeting agenda. The board approved Space Florida to enter into an agreement with Blue Origin regarding the facility last month. As part of the pact, the state will use tax dollars to reimburse Blue Origin up to $4 million in common infrastructure costs, such as roads and utilities…. 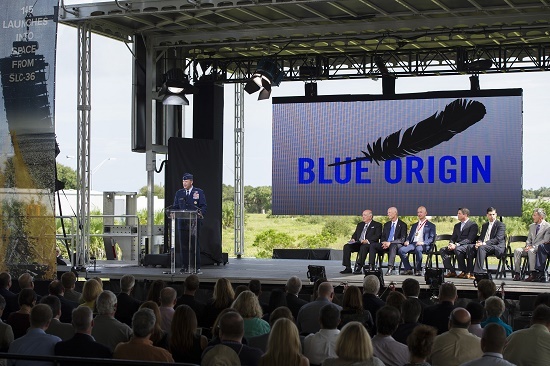 The new testing and refurbishment facility will be central to Blue Origin’s commitment to reusability. The first stage of the New Glenn rocket, which provides the muscle for the launch, will be fully reusable, Blue Origin has said. It will land on a ship after separation from the second stage.